122 Commonwealth is located on the south side of Commonwealth, between Clarendon and Dartmouth, with 120 Commonwealth to the east and 124 Commonwealth to the west. 122 Commonwealth was designed by Emerson and Fehmer, architects, and built ca. 1871-1872, one of four contiguous houses (118-120-122-124 Commonwealth). 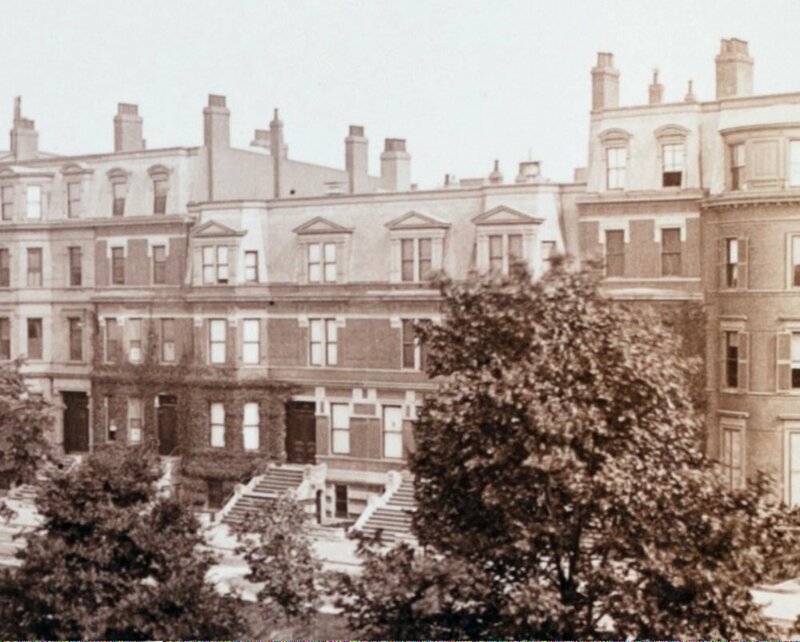 The houses were designed as a symmetrical composition, with the two taller and narrower houses (118 and 124 Commonwealth) flanking the two shorter and wider houses (120 and 122 Commonwealth). 122 and 124 Commonwealth were built ca. 1871-1872, and 118 and 120 Commonwealth were built ca. 1873. 122 and 124 Commonwealth were built on two lots, both originally 26 feet wide, that were purchased from the Commonwealth of Massachusetts on August 22, 1865, by dry goods merchant William Chadbourne. He and his wife, Isabel (Patterson) Chadbourne, lived at 48 Commonwealth. On May 22, 1866, he sold the lot to the east to his sister, Clara Dwight (Chadbourne) Berry of Cambridge, the widow of Charles Thomas Berry, and lot to the west to his sister Martha McMillan (Chadbourne) Haven of Charlton, the wife of Rev. John Haven. On October 13, 1869, both lots were purchased by Charles Austin Wood, an insurance agent and real estate investor, and the original owner of the Hotel Vendôme. On December 30, 1870, Charles Wood sold the eastern lot and 8 feet 8 inches of the western lot to Laura Lucretia (Williams) Case, the wife of wholesale dry goods merchant and banker James Brown Case. 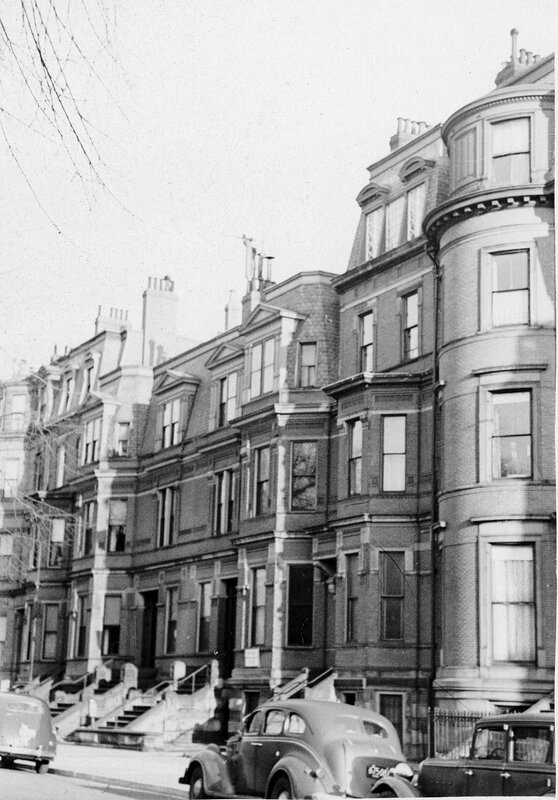 They lived at 52 Boylston and in Weston. They had 122 Commonwealth built on the combined 34 foot 8 inch lot. In March of 1871, Charles Wood sold the remaining 17 feet 4 inches of the western lot to Walter Cowing, where he had 124 Commonwealth built. Click here for an index to the deeds for 122 Commonwealth. In April of 1872, James and Laura Case purchased two lots to the east of 122 Commonwealth, where they had 118 Commonwealth and 120 Commonwealth built. They made 120 Commonwealth their home. On April 25, 1872, 122 Commonwealth was purchased from Laura Case by Frances (Van Dusen) Lee, the wife of James Lee, Jr. They previously had lived in Charlestown. James Lee was owner of the Middlesex Bleachery. The Lees continued to live at 122 Commonwealth during the 1876-1877 winter season, but moved thereafter to 282 Marlborough. On October 31, 1877, 122 Commonwealth was purchased by David W. Williams, Richards Bradley, and Lemuel Shaw, trustees under the will of John Davis Williams for the benefit of his granddaughter, Sarah Ann Williams (Merry) Bradley, the wife of Richards Bradley and the daughter of Robert Davis Coolidge Merry and Sarah Ann (Williams) Merry. 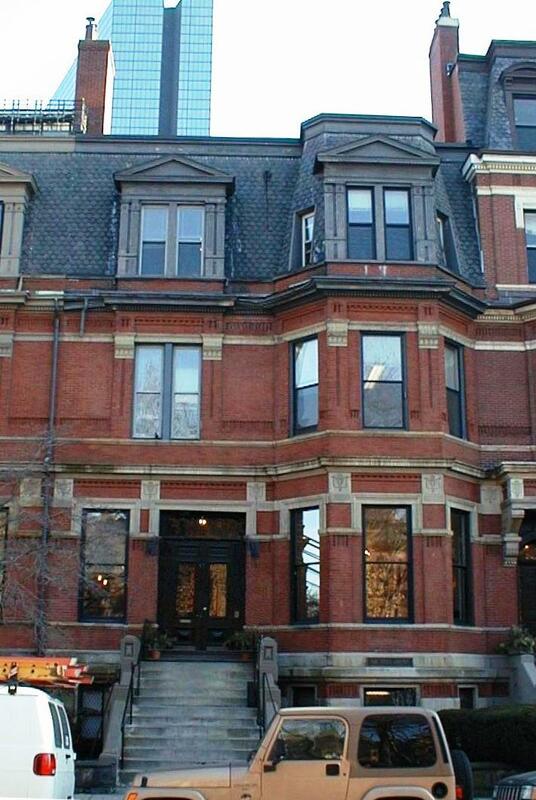 122 Commonwealth became the Boston home of Richards and Sarah Bradley. They also maintained a home in Brattleboro, Vermont. He was a retired merchant. In the mid-1880s, a brick stable was added at the back of the house. It is not shown on the 1874 Hopkins and 1883 Bromley maps, but is shown on the 1888 and subsequent Bromley maps. A May 6, 1894, Boston Globe article on the sale of the property notes that it includes a brick stable. The Bradleys continued to live at 122 Commonwealth during the 1890-1891 winter season, after which they retired to their home in Brattleboro. 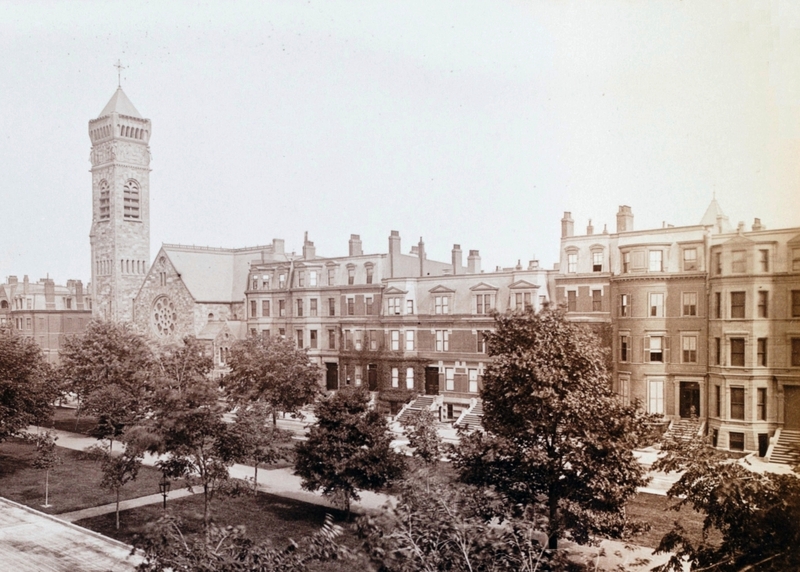 During the 1891-1892 winter season, 122 Commonwealth was the home of Horatio Appleton Lamb, a wholesale dry goods merchant and later served as treasurer of Simmons College, and his wife, Annie Lawrence (Rotch) Lamb. They also maintained a home in Milton. By the next season, they had moved to 107 Commonwealth. 122 Commonwealth was not listed in the 1893 Blue Book. By the 1893-1894 winter season, 122 Commonwealth was the home of Rt. Rev. William Lawrence and his wife, Julia (Cunningham) Lawrence. He had been consecrated Episcopal Bishop of Massachusetts in October of 1893, succeeding Phillips Brooks, who had died in January of that year. The Lawrences previously had lived in Cambridge. On May 2, 1894, Bishop Lawrence purchased the house from Sarah (Merry) Bradley’s trust. William and Julia Lawrence raised their seven surviving children at 122 Commonwealth: Marian (Mazie) Lawrence, who married in May of 1906 to investment banker Harold Peabody and lived in Milton and then at 302 Berkeley; Julia Lawrence, who married in May of 1905 to attorney Morton Lazell Fearey and lived in New York City; Sarah Lawrence, who married in November of 1923 to Rev. Charles Lewis Slattery and lived at 290 Marlborough after their marriage, he later becoming William Lawrence’s successor as Episcopal Bishop of Massachusetts; Ruth Lawrence, who married in June of 1911 to attorney Lansing Parmelee Reed and lived in New York City; William Appleton Lawrence, who married in June of 1912 to Hannah Wheelwright Cobb and lived in Cambridge, then Lynn, and later Springfield, and became Episcopal Bishop of Western Massachusetts; Eleanor (Elsie) Lawrence, who married in October of 1914 to lumber dealer Lewis Hunt Mills and lived in Portland, Oregon; and Frederic Cunningham Lawrence, who married in April of 1928 to Katharine Virginia Wylie and lived in Cambridge and then Brookline, and became Episcopal Suffragan Bishop of Massachusetts. “There was a side entrance under the steps which led into a dark, dismal hallway, off of which was the billiard-room with a billiard-table which was bought with the house. … There were about fifteen stone steps up to the front door, which opened into a hallway with a small reception room for Pa’s secretary on the left (who, most of the time, was Miss Marguerite Kimball). 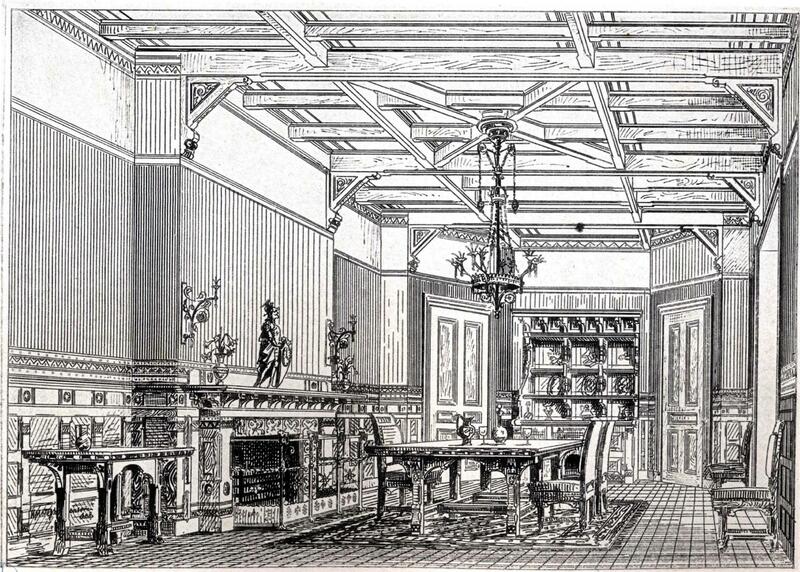 On the other side was a formal parlour, with a beautiful, large crystal chandelier which had to be all taken down and washed once a year…. “The front hall was wide and spacious, with the stairs running up one side, and on the other side the wall concealing the back stairs going up. After Pa had a heart warning in his seventies, he converted the old wood elevator (for bringing up fire-wood from the basement and ‘canal’ coal for the grates in the front rooms which were cold and needed a hotter fire) into a passenger elevator. The back room was Pa’s study at first, and later a warmer living-room, when he moved his study up-stairs when the family had largely left. The dining-room had a bronze figure of Mercury, together with large rubber-plants in the bay window. There were also plants in the front bay window, but they were smaller and did not thrive so well as they got no sun. In 1894 and 1895, at the time the Lawrences moved to 122 Commonwealth, the Bishop’s mother-in-law, Sarah (Parker) Cunningham, lived with them, probably taking care of their children (their daughter, Elinor, was born in January of 1894). 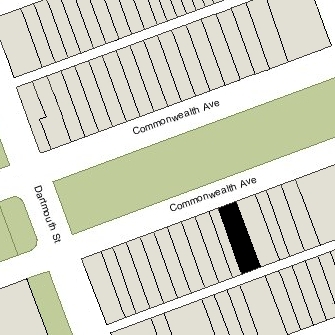 She subsequently moved to 357 Marlborough, and then, in 1901 purchased 124 Commonwealth, next door to the Lawrences, where she lived until her death in 1913. The Lawrences lived at 122 Commonwealth for the rest of their lives. The Boston house was their winter home. They spent the spring and fall in Cambridge (until 1911) or Readville/Milton (from 1913), and the summer at Mount Desert in Bar Harbor, Maine. In February of 1907, Bishop Lawrence applied for (and subsequently received) permission to install a 8 foot by 4 foot, one story brick “heater house” at the rear of the property. In June of 1913, he applied for (and subsequently received) permission to make modifications to the interior of the garage at the rear of the house (the former stable, which, by that time, had been converted into a three car garage). In 1929, he agreed to have an elevator installed at 122 Commonwealth. He distained using it until the mid-1930s, however. According to Cleveland Amory’s The Proper Bostonians, the “Bishop liked to move right along, even up stairs, and it took an attack of whooping cough, at the age of eighty-five — of which a friend recalled that it ‘delighted’ him to be the oldest person on record to have the disease — to make him use the elevator his family had installed in his four-story home” (Amory’s anecdote implies the elevator ran between all floors; however, the Boston permit records indicate that it was installed only to the second floor). William Lawrence died in November of 1941. On April 2, 1942, 122 Commonwealth was purchased from William Lawrence’s estate by real estate dealer Henry Joseph O’Meara. On May 1, 1942, 122 Commonwealth was purchased from Henry O’Meara by Dr. Peter Augustine Consales and Dr. John Francis Keane, both physicians. Peter Consales and his wife, Clymena (Dwelley) Consales, lived in Belmont; John Keane and his wife, Edith Marie (Wharton) Keane, lived in Newton. In April of 1942, Drs. Consales and Keane applied for (and subsequently received) permission to convert the property from a single-family dwelling into doctors’ offices, and subsequently moved their medical offices there. Dr. Consales previously had maintained his offices at 481 Beacon, and Dr. Keane had maintained his offices at 711 Boylston. In September of 1942, they wrote to the Building Commissioner asking if there would be “any objection” to their turning the third and fourth floors, and possibly a portion of the basement, into “residential suites” to house war-time workers. It is unclear whether this request was granted, but later permits indicate that there was one residential unit on the upper floors. In August of 1946, they applied for (and subsequently received) permission to extend the existing elevator to the fourth floor. In September of 1952, they applied for (and subsequently received) permission to renovate the garage, which was described as being a brick structure 20 feet wide by 20 feet deep by one story high (but presumably the same structure as the larger garage described in earlier permits granted to Bishop Lawrence). On December 15, 1953, 122 Commonwealth was purchased from Drs. Consales and Keane by National Realty Co., Inc.
On January 15, 1954, 122 Commonwealth was purchased from National Realty by Richard Earl Schroeder and his wife, Mary (Lima) Schroeder. Richard Schroeder was an electrical engineer, a loss prevention engineer with the American Mutual Liability Insurance Company, and, from the mid-1950s, a lawyer specializing in product liability. In January of 1954. the Schroeders applied for (and subsequently received) permission to convert the property from medical offices and one apartment to medical offices and two apartments, one of which they made their home. They previously had lived in an apartment at 186 Commonwealth. Peter Consales and John Keane continued to maintain their medical offices at 122 Commonwealth. At some point during the 1950s or early 1960s, the garage at the rear of the house was removed. It was there in September of 1952 but was gone by the early 1960s. On April 28, 1961, 122 Commonwealth was purchased from Richard and Mary Schroeder by Louis Francis Musco, George J. Brennan, Jr., and James P. Lynch, trustees of the Commonwealth Realty Trust. They acquired the property to become the location of Bay State Academy (later Bay State College), which Louis Musco and George Brennan had founded in 1946. James Lynch was dean of the school, which previously had been located at 30 Huntington. In June of 1961, the trust applied for (and subsequently received) permission to convert the property into a school. 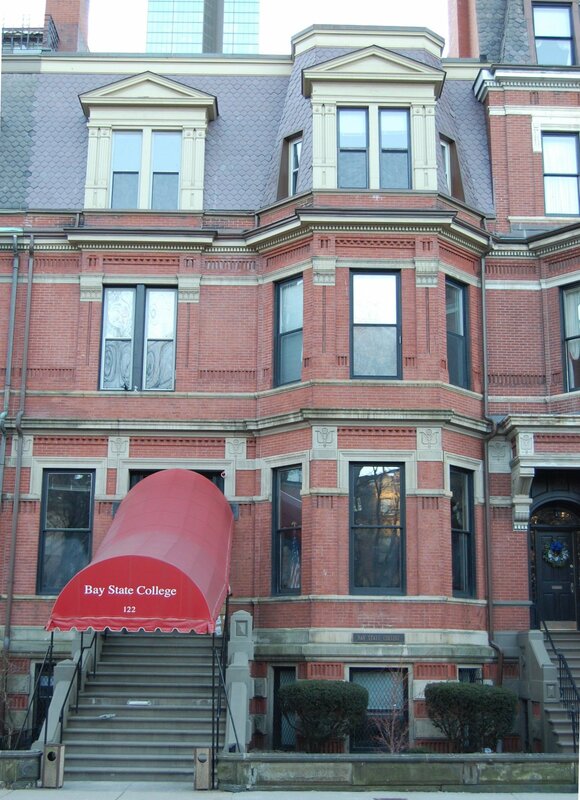 In July of 1965, Bay State applied for permission to construct a two story addition in the rear area, the full width of the building and two stories high. The space was proposed to be used for “seminar-study” purposes and, presumably, would have been built in the same area (but larger than) where the garage formerly was located. The application was denied in October of 1965 by the zoning Board of Appeal. On January 21, 1988, 122 Commonwealth was purchased from the Commonwealth Realty Trust by Thomas E. Langford and Frederick G. Pfannenstiehl, trustees. Thomas Langford was president of Bay State College and Frederick Pfannenstiehl was chairman of the board. On October 1, 2003, Frederick G. Pfannenstiehl and Craig F. Pfannenstiehl, current trustees of the trust established in 1988, transferred the property to themselves as trustees of a newly-established trust. 122 Commonwealth remained Bay State College in 2016.